Even the most adventurous alchemists return to their favoured base elements in the pursuit of maximum potency. So it was that The Phantom Band – those wilfully mercurial outriders – reached album number three seeking a return to the first principles of performance that brought them together to begin with. It’s an attempt to capture the six of them live; raw, rugged, perhaps looser, but still fit to burst with earworms and oddities from every nook and cranny. Strange Friend doesn’t have one firm concept at its root but several, infused with multiple meanings it reflects the constant percolation of voices within the Scottish six-piece, all jostling for their say. Yet musically Strange Friend is perhaps the most straight-up set of recordings the band have put to wax. Fans of their previous critically-acclaimed albums, fear not; those burbling, fluttering electronics that drag their sound through a wormhole and out into the 70’s alongside the soundtracks of John Carpenter and the kosmische of Kraftwerk and Neu! remain; the elements of folk; the woozy organ sounds. 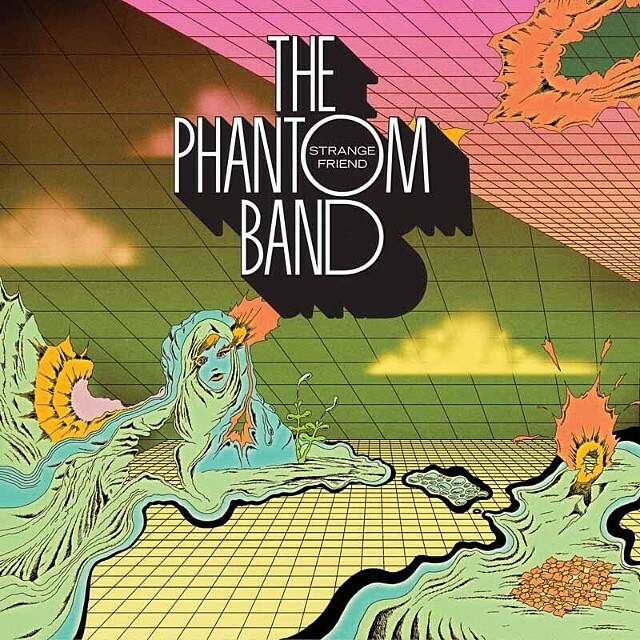 The difference is now it feels as though an imaginary thread’s been pulled tight through it all; The Phantom Band were always a rock band that enjoyed pushing the pre-conceptions of what that could mean – never the other way round. Strange Friend, take the driving opening track and first single, ‘The Wind That Cried The World’. It’s been three and a half years since anyone heard anything from The Phantom Band, something that they disregard as a notable time away. “We’ve always moved at our own glacial pace,” says guitarist Duncan Marquiss. Yet, with due respect to the group, their absence has been long enough to have been felt; their time taken in getting the record together was down partly to the inevitabilities of outside lives, partly due to a change of drummer – with Iain Stewart now behind the kit – and partly because of the fiercely democratic ethos the band has maintained since its beginning. Strange Friend, like their previous outings, is the sound of six clearly distinct personalities attempting to inflict their will on the rest of the group – it’s no surprise the phrase ‘love/hate’ is brought up repeatedly by all its members in an attempt to describe their relationship with the band as an entity – but it’s that fission between each other’s contributions that provides the intangible individuality of their music. “Like all true utopias it can feel impossible to maintain,” admits Marquiss. It’s something that you can’t help but feel would be fully deserved for these most strange but wonderful returning friends. Adam Stafford is a musician and filmmaker from Falkirk, Central Scotland. Now based in Glasgow he is the founder of Wise Blood Industries and was the singer and songwriter in the group Y’all is Fantasy Island (active between 05-11). In November 2010 he recorded the solo LP Build a Harbour Immediately which was co-produced by Paul Savage (Mogwai/ex-Delgados) in Chem 19 Studios. It was released on Wise Blood in August 2011 to critical acclaim and featured on many End-of-Year lists in the music blogging community (read them HERE). Recently he has been concentrating on live solo work and films. He has won seven international awards for his short documentary The Shutdown, made in collaboration with novelist Alan Bissett, directed a music video for The Twilight Sad’s single Seven Years of Letters (winner of Best Video at the New Scottish Music Awards 2011). He recently completed a 2nd short film No Hope For Men Below (2012), a poetic dramatisation of The Redding Pit Disaster in Falkirk 1923. In July 2013 Stafford issued the follow-up to Harbour, titled Imaginary Walls Collapse via Edinburgh label Song, by Toad and Canadian imprint Kingfisher Bluez to unanimously positive reviews. In April 2014, Imaginary Walls Collapse was long-listed for The Scottish Album of the Year Award. Limited amount will be available (no booking fee for cash sales) from iiMusic, The Academy, Belmont St.